Minecraft Jr. is for students ages 6 – 9. 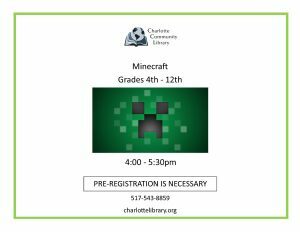 Minecraft is for students in grades 4 – 12. Pre-registration is required. Call 543-8859. If you already have a Minecraft username, enter it here.